This week has been going by quickly, at least to me. But I've had a huge project I've been working on behind-the-scenes here. So having something keeping me very much occupied is certainly a good way to make time go by. But that just means it's going to be the weekend really soon. Weekend = gaming. Gaming = terrain. 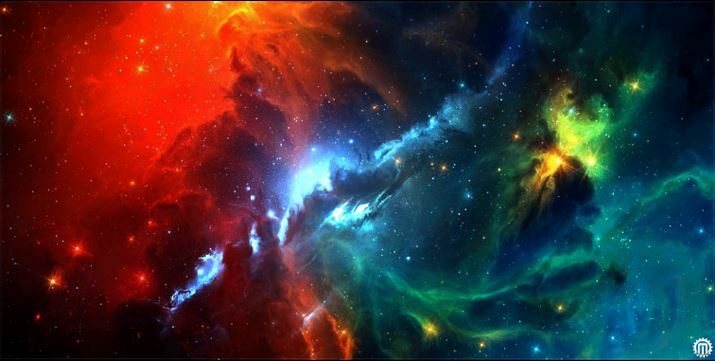 So lets make your gaming tables look good. 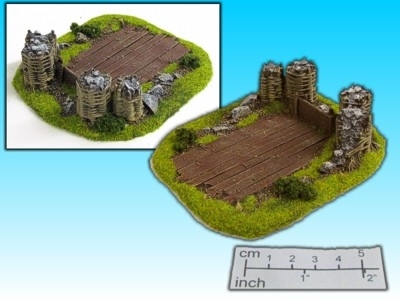 A quick Terrain Corner for you today. How's yours going? Mine's... being a Monday. But, as usual, we'll make it through. And getting our gaming tables looking good is going to help. 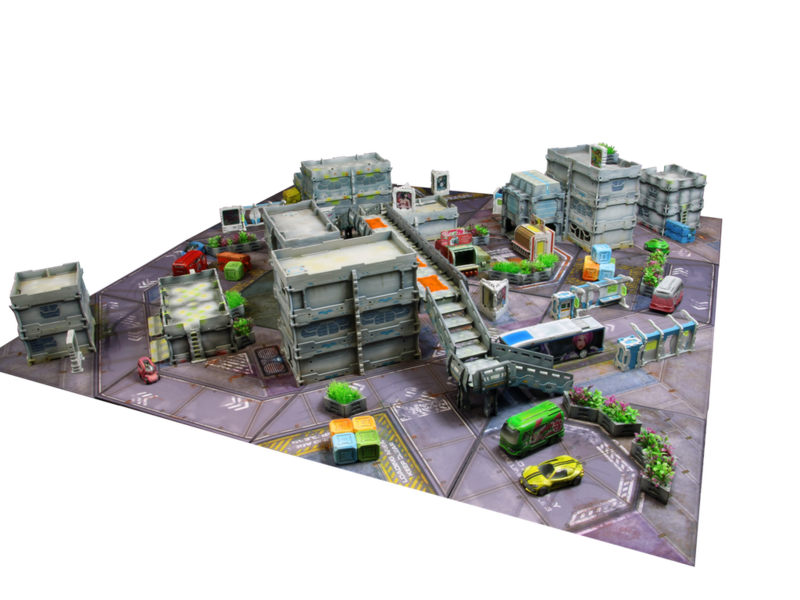 Today in the Terrain Corner we have: New Terrain Available For Beyond the Gates of Antares, Final Week For Eslo Terrain Kickstarter, Brigade Models release 2mm Scale Dockyard Buildings, and Operation Delta Gaming Mat Available From Pwork Wargame. Also, it was pointed out to me that "I've not" and "I haven't" are the exact same thing. So, we've got a new edition of 40k coming out in a couple days. 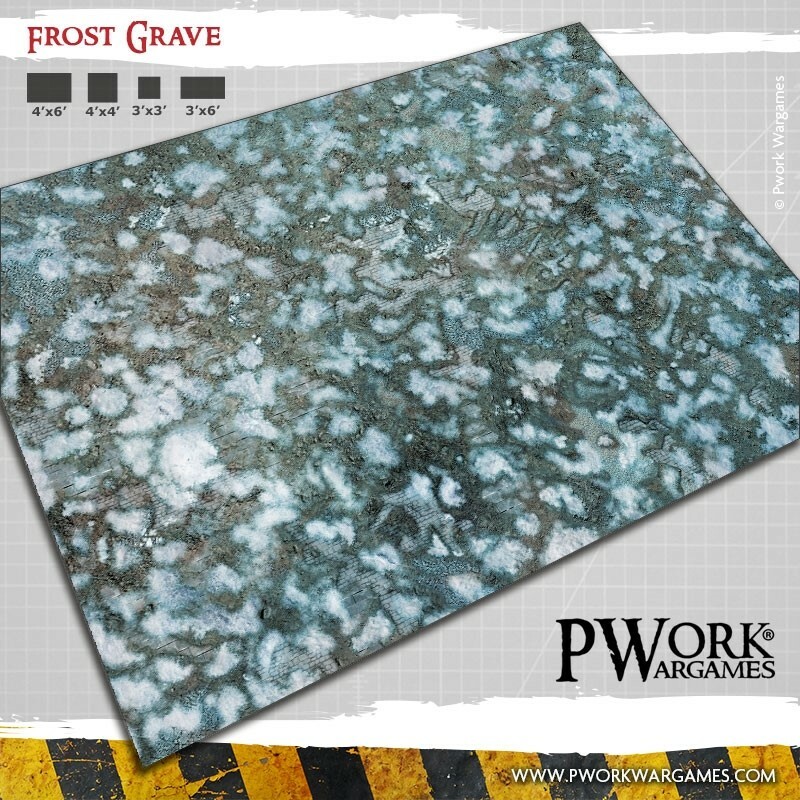 Let's make sure your gaming tables look as good as possible for when you start throwing down. 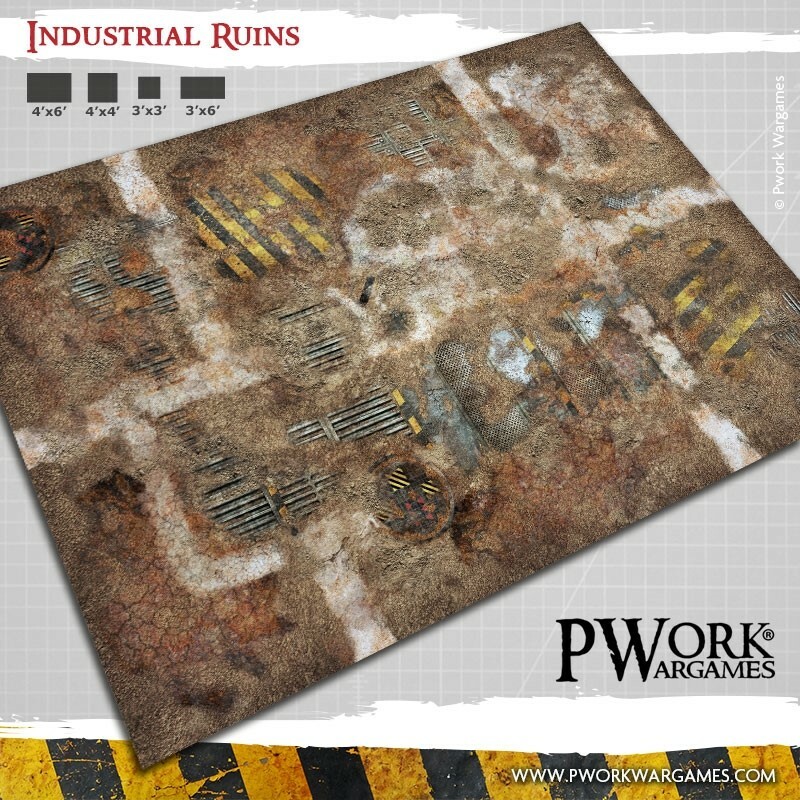 Today in the Terrain Corner we have: Industrial Ruins Gaming Mat Available From Pwork Wargame, WWII German Town Kickstarter Happening Now, and Heroic Maps - The Duke's Stronghold Now Available. It's the penultimate day of the year. 2016 is on its way out. Lots of people are going to be partying about it. I'm sure some of that will include gaming. At least, I hope it does for you. Anyway, if you're going to be partying to midnight tomorrow, you'll want to stock up on some bite-size gaming stories. So, not tabletop gaming related, but as a Chicago native, waking up this morning to hear the Cubs won the World Series was pretty awesome, even though I've not followed baseball for quite a long time. Too bad we don't have MLB Showdown or that MLB Clix game around anymore. 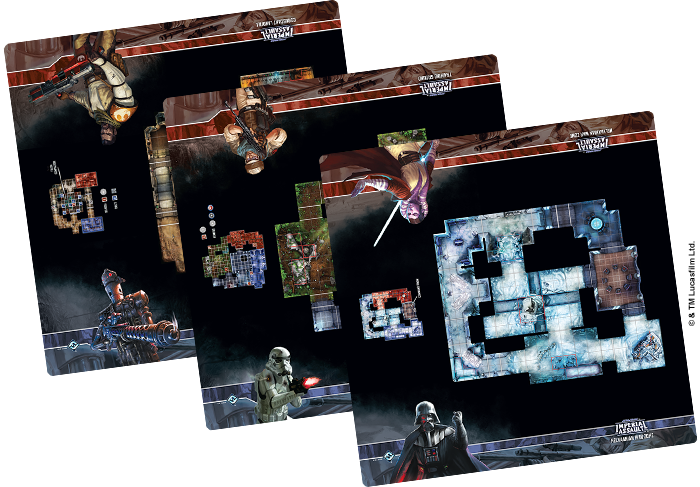 Anyway, that aside, let's talk about making sure your gaming tabletop looks as good as possible. 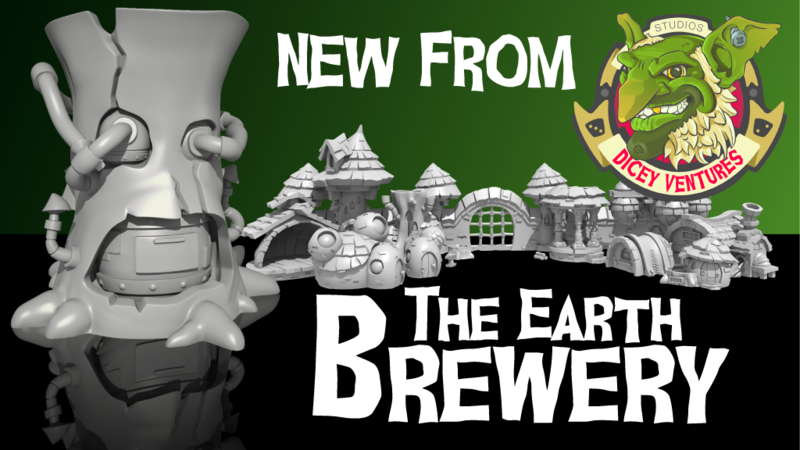 Today in the Terrain Corner we have: 15% Off All Sarissa Single Terrain Pieces At Warlord Games, New Releases From ESLO: 3D Game Elements for Boardgames, Dicey Ventures Running Earth Brewery Kickstarter, New Snowfields Dropfleet Commander Game Mat from Deep-Cut Studio, and Tabletop World Posts Watermill Sneak Peek. I hope your Monday is going along well. It's kind of a hot one here in Atlanta. Even inside the office it's not exactly comfortable. But it's ok. I'll make it through. Just gotta focus on one post at a time. And currently, that post is the Terrain Corner for today. 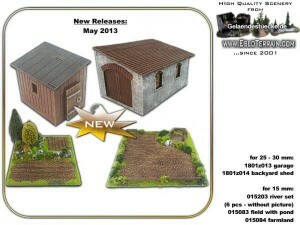 This time around we have: New Cult Village Buildings Range From Pigeon Guard Games, New ITC Terrain: Compact Urban Building, New Goals Unlocked And Added For Maze of the Dead Kickstarter, New Playmats Available For Imperial Assault, Eslo Terrain: July New Releases & 15th Year Anniversary Offer for a Longer Time, and Cyber City: Pwork Wargames Sci-Fi Gaming Mat Now Available. Ok, so that's not so great a thing. But we'll get through. We already had our Wyrd preview for the day. So now we get to our Terrain Corner. It should help. Anyway, today we have: Eslo Terrain Spaceship Module Pre-Order Package, New Space Mat Designs are available at Mats by Mars, Munitorum Armoured Containers Available To Order from Games Workshop, and West Land Pwork Wargames Fantasy Gaming Mat Available Now. Eslo Terrain updated their webshop with their latest releases for October. 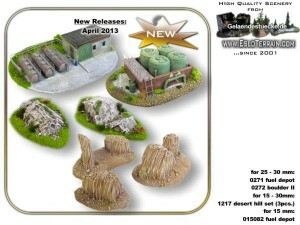 Eslo Terrain posted their May releases up on their Facebook page. Go check 'em out. 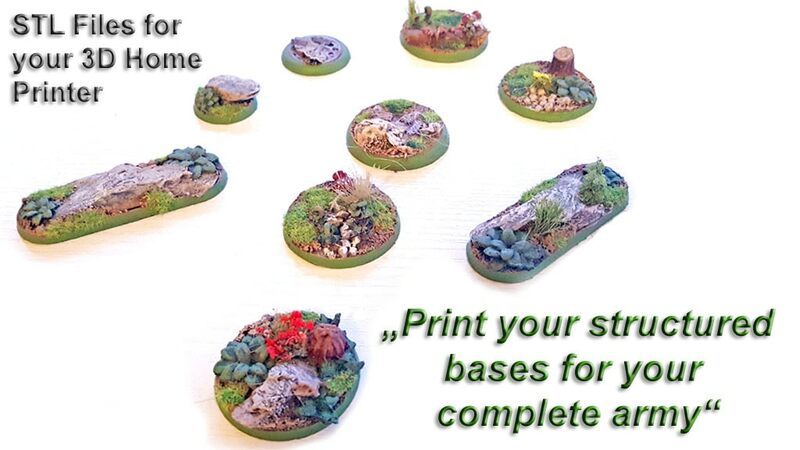 Elso Terrain helps brighten up your tabletop with their new April releases. Eslo Terrain now has their February/March releases available over in their webshop. 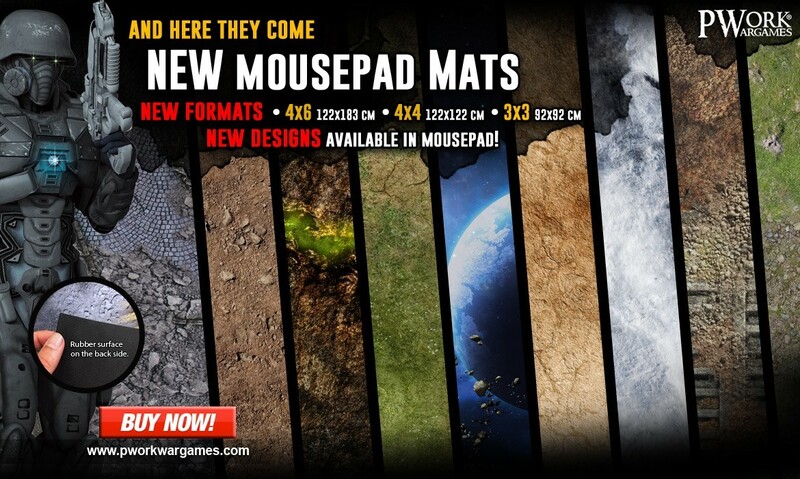 Go and beautify your gaming table. 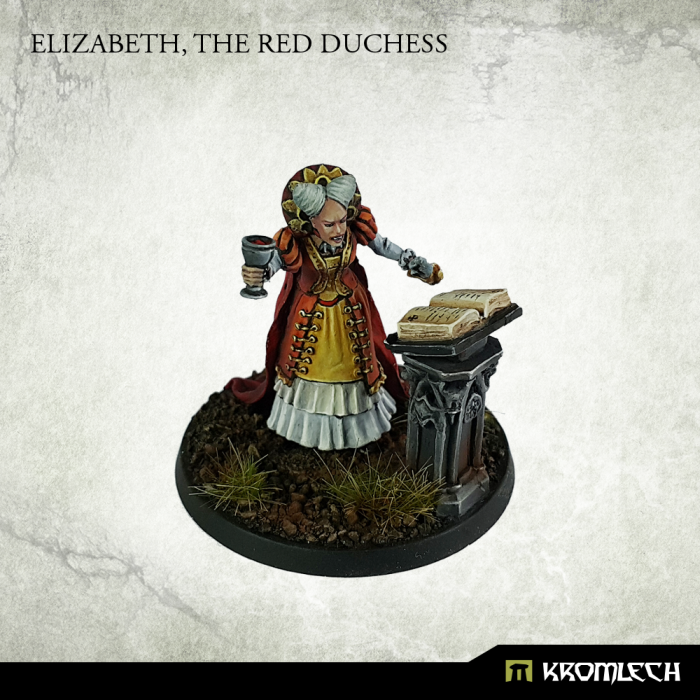 Hello to all tabletop wargamers modeling fans and retail stores! 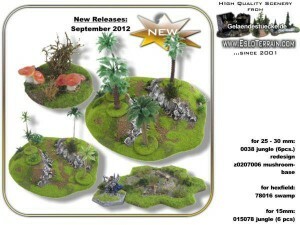 Eslo Terrain has posted up a photo of their September releases. See what they've got coming for this month. 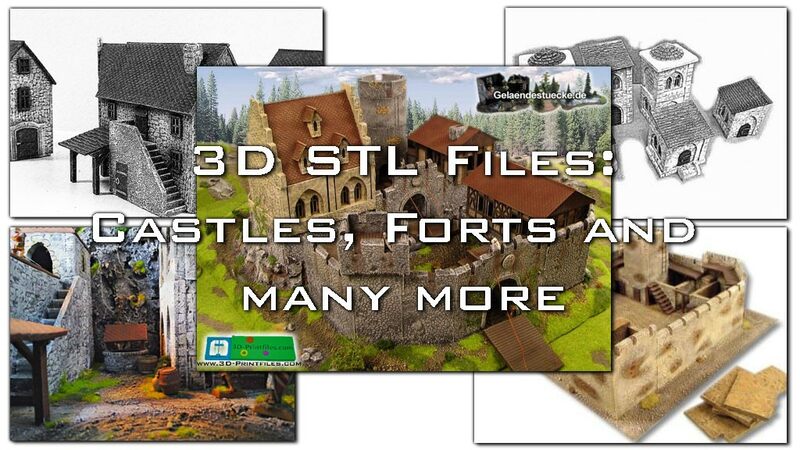 Hello to all tabletop wargamers, modeling fans, and retail stores! All of the new releases can be found in our webshop. If you have questions, contact us or our distributors, please. 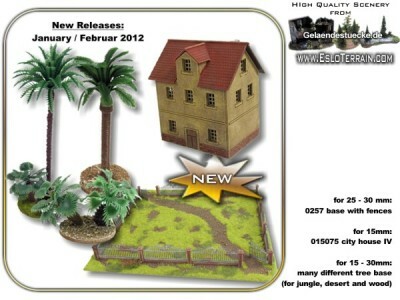 Eslo Terrain has a photo up of what they've got in store for the next months worth of releases. 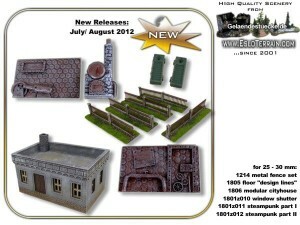 ESLO Terrain shows off their June releases as well as has a look at some new Steampunk-inspired pieces they've got coming out soon. 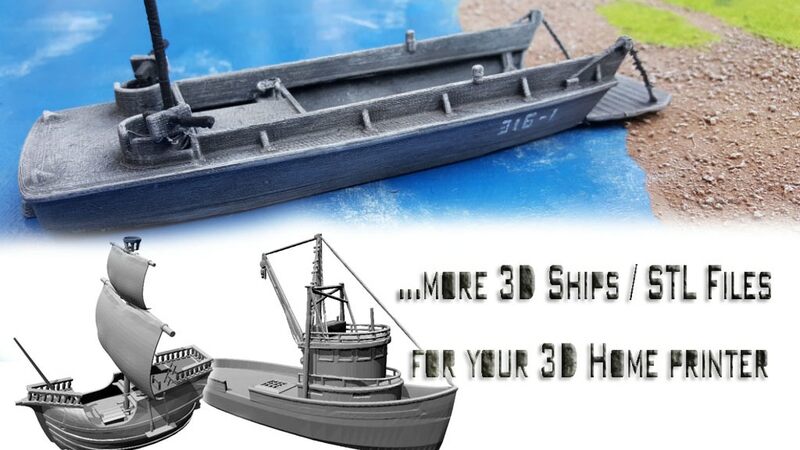 Hello to all tabletop wargamers, modeling fans & retail stores! 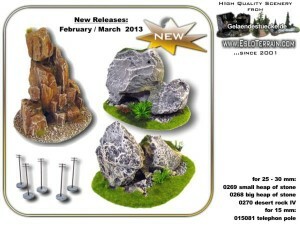 Games Trust has a review up on their website about Eslo Terrain's new water and island terrain pieces. Check it out (if you know or have a way to translate German). After we found out, that the Amera islands and mountains are inadequate for Dystopian Wars and Spartan Games is producing more an more land units and buildings, we contacted ESLO. This led to a cooperation to create terrain, which allows see and land units to be used within a Dystopian Wars game. The results of the cooperation can be found in our review. Eslo Terrain expands their line with new water and island terrain pieces for your tabletop. we have good news for you. We have added to our online shop a new range. These isles are ready to play, realistically designed, and large with many places for buildings and units. We have added three different isles (round, long and starter isle). Our new boards are 90 x 60 x 2 cm. 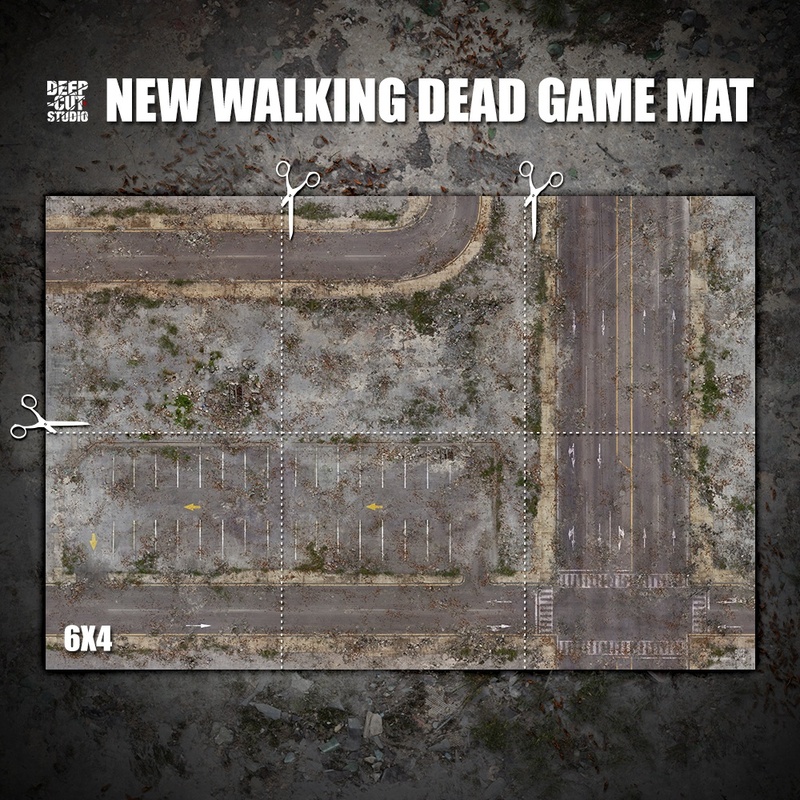 You can also specify what is on the reverse side (example: grass/stone). In the next few days, all of our Facebook fans will receive a 15%-off voucher - this is a 'thanks' for your great interest. Eslo Terrain shows off their March releases. Make your miniatures table come to life! All of our new releases can be found in our webshop. You can receive further information on our webpage: Gelaendestuecke.de or esloterrain.com. All new releases find you in our webshop. You receive further information on our web page: www.Gelaendestuecke.de or www.esloterrain.com. If you have questions, contact us or our distributors, please.